35. Tage Alter Musik in Herne, Cembalo, Clavecin, Harpsichord – Regionale Traditionen des Cembalobaus, (Herne, 2012). Figure 1 – The Franco-Flemish harpsichord before the musical and decorative restorations. This paper will first describe the musical and decorative states of the instrument shown in Figure 1 above. It will be shown here that the instrument was originally made in Antwerp, probably in the first half of the seventeenth century, and was then re-worked a number of times in Paris in the second half of the eighteenth century. The eighteenth-century states will be described briefly in order better to establish what remains of the original state, and therefore what parts can be used to analyse this state. The small number of original remaining parts found from this analysis will be studied in an unconventional way in order to establish conclusively the instrument’s origins. Because the eighteenth-century wrestplank was lost in a 20th-century restoration, an new and unusual method, analogous to that used to study the original state, will be used to establish with a high degree of confidence the string lengths and the lateral nut-pin spacing in order to restore the eighteenth-century scalings and mechanical function of the instrument. The accuracy of the methods that I have developed and used here have a precision which adds a new dimension to the process of instrument authentication and considerably increases the certainty with which a harpsichord can be attributed—or not, as the case may be—to a given maker, as well as to the reconstruction process often encountered in a restoration. The instrument under examination is an extremely fine five-octave, double-manual harpsichord. It has a very interesting and complicated recent history which I won’t elaborate here except to say that it underwent an unfortunate restoration in São Paulo in Brazil in 1971. In this restoration, Roberto De Regina replaced the 1786 baseboard and wrestplank, replaced the action cloths with modern piano felts, added lead to the jacks and keylevers (this has subsequently suffered from lead disease and has split many of the eighteenth-century jacks and keylevers), re-strung it with modern steel and spring-brass strings and re-voiced it using quill from some unknown South-American bird. He also removed a fourth rear row of jacks and a pedal or genouillère mechanism which would once have operated this additional row of jacks as well as at least some of the rows that still remain. The fourth row of jacks was probably originally a peau de buffle register. De Regina reported that he had found the signature or calling card of Jacques Barberini, who worked in Paris during the second half of the eighteenth century, somewhere inside the instrument. 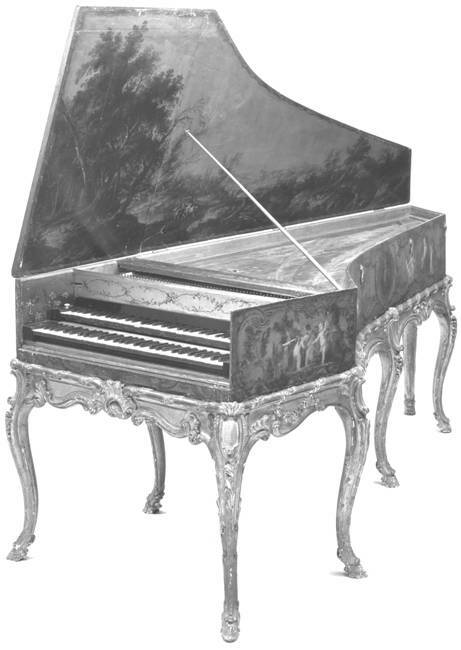 In general appearance, the harpsichord has all of the usual characteristics of a seventeenth-century instrument that has undergone a French ravalement in the late eighteenth century (see Figure 1 which shows the case and lid before cleaning). The instrument has a French carved and gilt stand, external case paintings, a painted soundboard and an original seventeenth-century Flemish landscape painting inside the lid. The exterior of the lid has paintings from the school of François Boucher. It also has a beautiful soundwell and keywell decoration. The stand is somewhat higher than normal and extremely fine in its carving and gilding but is almost certainly of nineteenth-century date. The external case decoration, in the style known as vernis martin developed by the Parisian Martin brothers, is also extremely rich and elaborate. 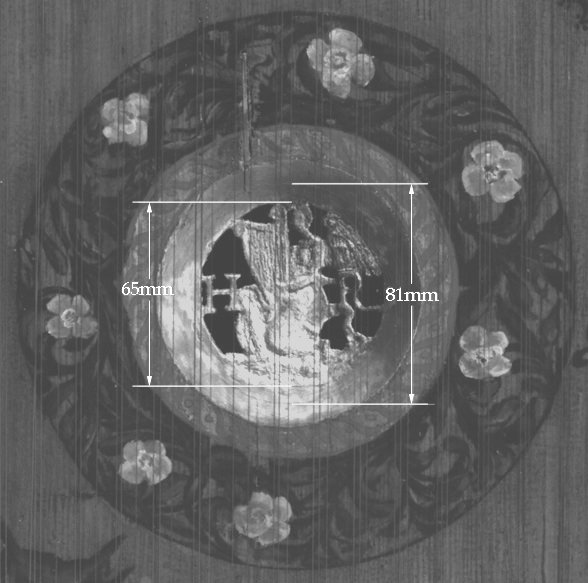 The harpsichord has a Ruckers soundboard rosette with the initials “HR” (see Figure 2). The presence of this rosette along with all the usual signs of an eighteenth-century ravalement suggest at first that the instrument is a ravalement of an earlier Ruckers harpsichord. Figure 2 — Photograph of the soundboard rosette showing the outer diameter of the original bevelled rose hole (81mm) compared with the diameter of the Ioannes Ruckers rosette (65mm) placed inside this larger hole. It is clear from the alterations to the structure and decoration of the instrument that the eighteenth-century ravalement occurred in several stages. These are relatively complicated to analyse and to describe. Their full description and that of the nineteenth and twentieth century alterations are mostly not germane to this paper. Suffice it to say that the bottom jacks of two of the registers are dated 1756, and this would seem to correspond to the style of the earliest decorative state. There is now no remaining trace of the calling card, mentioned earlier, of Jacques Barberini (see footnote 1), and it seems likely that this was probably attached to either the baseboard or the wrestplank and was lost when these were destroyed in the 1971 intervention. A further faint inscription written in pencil or silverpoint on the front surface of the lower belly rail was discovered and this appears to read: “Refait par hoffmann a Paris.” This is likely the signature of Nicolas Hoffmann, who was active as a keyboard-instrument maker in Paris from 1781 to 1790. The most obvious sign that the instrument might be by one of the members of the Ruckers family is the “HR” soundboard rosette (see Figure 2). 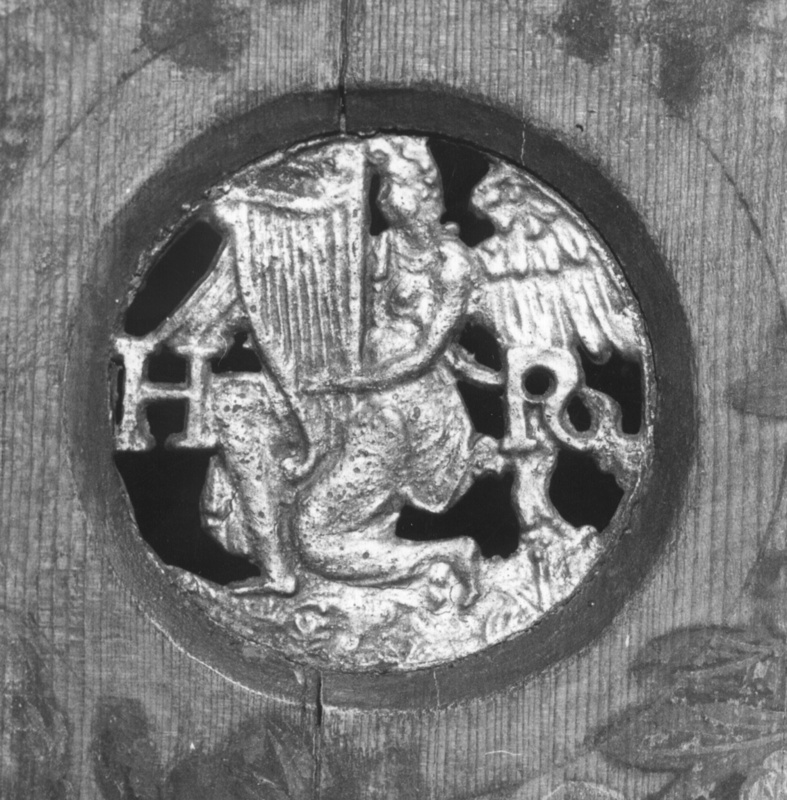 This particular casting of the rosette, although bearing the initials “HR,” is actually the one found in the early instruments of Ioannes Ruckers and not in those of Hans Ruckers, Ioannes’s father. Figure 3 – Ruckers rosettes in genuine Ruckers harpsichords. 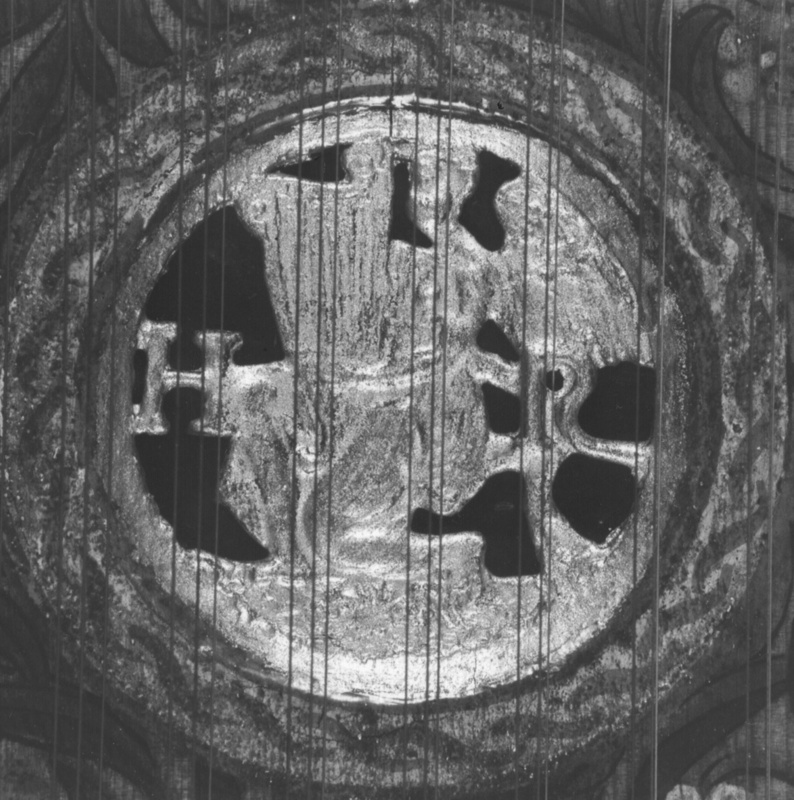 The most noticeable differences between the two rosettes seen in Figure 3 is that the initials “HR” are flattened in the rosette on the left, and that the right wing of the angel behind the harp is missing in the casting of the Ioannes Ruckers rosette on the right. Various other differences can be noted. Although superficially similar, the two rosettes definitely represent different castings, and are found in other instruments by these two builders made during different periods of their respective lifetimes. The diameters of both of these rosettes measured inside the bevelled soundboard hole is close to 65mm. The rosette from the Franco-Flemish harpsichord (Figure 2) is clearly from the same casting as that of Ioannes Ruckers shown on the right of Figure 3. As marked on the rosette, the diameter of the hole in the soundboard (easily visible in places) is 81 mm, which is considerably greater than that of the Ioannes Ruckers rosette shown on the right of Figure 3 which is only 65 mm. The rosette therefore appears to be genuine, but has been inserted into an 81-mm beveled hole that was originally larger than the present rosette. It is also true that the rosettes of Ioannes Ruckers double-manual harpsichords made after the period around 1617, have a diameter of 85mm, but it would be impossible to squeeze a rose of this diameter into the 81mm soundboard hole. It must therefore have been the rosette of a maker who was not a member of the Ruckers family since none of the rosettes of any members of the Ruckers/Couchet family used a rosette of this diameter. The gap between the edge of the present replacement rosette and the inside of the bevel has been filled out with gesso or some other filler. The question arises: Is this instrument really a Ruckers or, if not, at least Flemish in its origins? The “HR” rosette in the soundboard suggests, at first, that it is a Ruckers but features of the hole into which the rosette has been placed suggest it is not. Because of the drastic alterations to the instrument carried out during the eighteenth-century ravalements and the unfortunate ‘restoration’ of 1971, very little of the original structure survives on which to base a judgment or decision about the instrument’s origins. Only the bentside, cheek, a part of the tail, a part of the 4' hitchpin rail, some of the soundboard barring and the soundboard and bridges remain of the instrument’s original fabric. An examination of the bridges and the line of the 4' hitchpins shows that neither has been repinned in the course of the eighteenth-century ravalement procedures. A second set of 8' bridge pins, was added to give the instrument a 2x8' disposition, but the original set of 8' bridge pins was re-used. Indeed, the 4' bridge and the 4' hitchpins have doubled pinning every twelve notes (one octave), thus suggesting that the instrument was originally a double-manual harpsichord with doubled pairs of strings for the notes eI/gT for non-aligned keyboards a fourth apart. The positions of the bridge pins, hitchpins, and extension joins in the bridges were marked on a string-band strip made for the instrument. The doubled pins for the eI/gT strings were then used to identify the original notes of the strings which were placed on the rest of the single bridge pins (see Table 1). The existence of the 3 sets of double pins for the eI/gT notes strongly suggests that the instrument, if not a Ruckers, was originally at least a Flemish double-manual harpsichord with unaligned keyboards. This seems to indicate, but does not confirm, that the instrument belongs to the Ruckers/Couchet tradition. More factors therefore need to be taken into account. Because of the importance of the soundboard to the instrument’s authentication, the characteristic features of a genuine Ruckers soundboard outlined in my book on the Ruckers family have been compared with those of the soundboard in this instrument. Of the four comparisons made, three indicate clearly that the soundboard of the instrument at hand was not built in the usual style of the Ruckers/Couchet workshops. This information, combined with the fact that the “HR” soundboard rosette does not fit into the rose hole, suggests with a high degree of certainty that the instrument was not originally constructed by any member of the Ruckers family. The presence of the eI/gT doubled 4' bridge pins and 4' hitchpins (see Figure 4) is consistent with the instrument having been made in Antwerp, where makers other than those of the Ruckers/Couchet family also constructed non-aligned, double-manual harpsichords. In order to establish where the instrument was originally built, a more refined method of analysis is required. The analysis of the unit of measurement used to build a harpsichord – or any musical instrument – has been found to be a useful tool in the study of the design principles used by the historical makers to lay out and build their instruments. Normally until now an analysis of the unit of measurement has been used only to investigate the measurement laid out by the makers of the baseboard, case height, keyboard dimensions, string scalings, etc. But of course the unit of measurement being used by the historical makers permeated all aspects of the design and construction of their instruments and also included the way in which the strings were spaced laterally with respect to one another. This aspect of the construction of a harpsichord, spinet, virginal and clavichord is reflected in the way the bridge and nut pins are spaced relative to one another. Because so many of the usual dimensions of this particular instrument have been altered in the eighteenth-century ravalement processes, it was decided to try to analyse the lateral spacing of the bridge pins which remains unaltered, at least for the original pinning, to see if this might yield the unit of measurement being used in their design. Figure 5 – The lateral bridge pin measurements. The distances indicated were measured for each note, and are recorded below in Table 1. Table 1 gives the distances of the short 8' and the 4' bridge pins from the inside of the spine of the instrument being examined. Using the positions of the doubled sets of 4' bridge and hitchpins, it is then possible to assign the pitches of the strings that would have been placed at each of the bridge pins (columns 1 and 2 of Table 1). The difference in pitch of one semitone between the original upper-manual notes (column 2) and the notes of the present compass (column 3) indicates that the person who carried out the ravalement encountered the usual Van Blankenburg problem in the process of adding the second set of 8' strings in the ravalement process. The notes for the original strings of each bridge pin are shown along with the present notes in the two left-hand columns of Table 1. Table 1 - Distance of the short 8' bridge pins and the 4' bridge pins from the spine in millimetres. The shaded values are those of the pins added in the eighteenth-century ravalements. The measured distances from Table 1 are plotted in Figure 5. Here the distances of the 8' bridge pins to the spine are indicated with small circles, those of the 4' pins with small squares and the transition from the original pins to those of the ravalement are marked with vertical lines. The graph of the positions of the bridge pins shown in Figure 6 clearly forms a series of straight lines. These show that the lateral bridge-pin spacings of both the 8' and the 4' bridges fall into two distinct sections. Above the present 8' played note c (the original lower-manual note fT), the bridge pins on both bridges have one spacing relative to one another, whereas below c they have another, slightly smaller spacing. This difference is indicated by the slight change in the slope of the line that joins the plotted points above and below the present 8' played note c as well as above and below the 4' played note c1 (which, of course, are both activated by the same keylever). This slight change in the spacing of the bass bridge pinning is quite normal and is found in almost all instruments from all schools of harpsichord building throughout the historical period. In order to improve the quality of the bass notes, it proved necessary to move the bass end of the bridge as far as possible from the spine side of the instrument. This move created a wider space at the bass end of the bridge between the bridges and the spine liner. The resulting increase in soundboard flexibility and unhindered vibration in the soundboard area near the bass ends of the bridges notably improved the quality of the lowest bass sound. To provide the necessary flexibility, the strings were positioned parallel to one another and to the spine above the present played note c. From this note downward, the strings were angled away from the spine (as seen in table 1, this would originally have involved the lowest fifteen notes—from C/E to fT—on the lower manual). Thus, the strings gradually became farther away from the spine at the bridge end than at the nut, and therefore gradually less parallel to the spine. Although only the original bridge-pin position measurements (those between the vertical lines in Figure 6) are used in the analysis below, it is clear from the graph that the person who carried out the ravalement was meticulous in the way he spaced the strings on the bridge extensions. The same spacing employed by the original maker was used for the treble notes above the ends of the original bridges and a different spacing in the bass below the original ends of the bridges. But the spacing of the strings on the bridge extensions match closely that of the original maker. In other words, the slopes of the lines plotting the pin positions are accurately similar for the pins added on the bridge extensions (the dashed line that extends the solid line fitted to the points for the original section of the bridge) as well as for the original pins in each part of the compass. where y is the measured distance of the bridge pin from the spine (the vertical y axis), x is an integral number corresponding to the number of the bridge pin (the horizontal x axis), b is the value of y when x = 0 and m is the slope of the line and is equivalent to the regular spacing of the bridge pins and strings. The regression analysis was carried out separately for each of the straight-line segments shown in Figure 6 above and below the 8' played note c, in order to calculate the value of the slope or the regular spacing of the strings in each section. Not surprisingly, the value of the slope is very nearly the same for both of the bass sections as well as for both of the middle and treble sections of the two bridges. This reflects that the strings require the same spacing in each section so that the 4' and 8' strings remain the same distance apart throughout the instrument’s compass. This suggests very strongly that the maker spaced out the middle and treble strings, jackslots, and keytails so that twenty of each occupied a space of exactly one Flemish voet. This, in turn, strongly implies that the maker spaced the bottom fifteen bass strings on the 8' and 4' bridges so that each occupied a space of exactly half a duim, or so that twenty-two strings occupied a space of exactly one Flemish voet. The difference in the spacing of the bridge pins in the treble and in the bass is 14.175 – 12.78 = 1.394mm. Since the bottom 12 notes have this spacing the bottom pin is moved 12x1.39 = 16.74mm further from the spine than if the bridge-pin spacing had been maintained at its regular value in the treble. This is therefore 16.74/25.48 = 0.656 duimen, or about of a duim. The simplicity and elegance of the way the strings were spaced on the bridges is striking. Use of the value of the 25.48 mm Antwerp short duim. in the design and layout of the lateral spacing of the original bridge pins is a positive indication confirming that the harpsichord was indeed built in Antwerp. In order to determine whether a Ruckers-like method of spacing the strings was used in the Franco-Flemish instrument under study, an analysis similar to that carried out above has been applied to the Ioannes Ruckers double-manual harpsichord made in Antwerp in 1638. 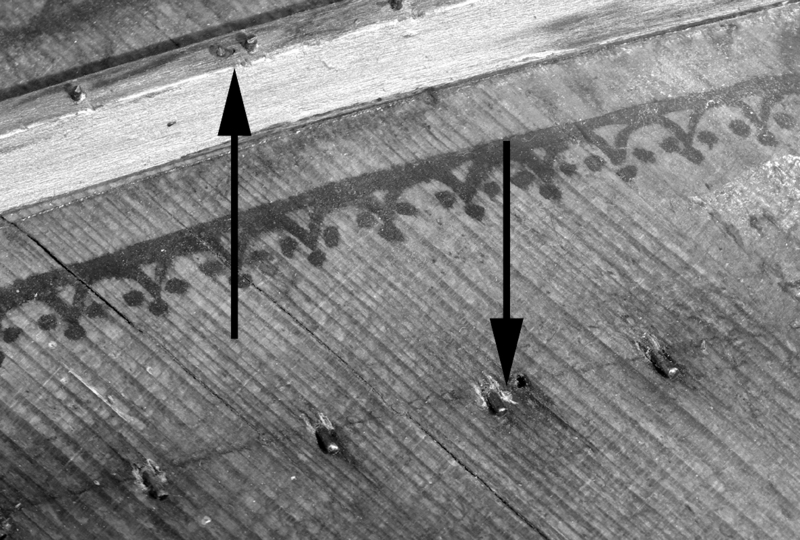 The lateral spacings of the 4' and 8' bridge pins from the spine were measured and are plotted in Figure 7. The graph shows that the lateral spacing of pins on both bridges of the 1638 Ioannes Ruckers harpsichord again divides into two distinct sections as was seen to happen with the Franco-Flemish harpsichord being discussed here. The ten lower-manual bass notes, C/E to cT (see the scale at the top of the graph), are in one section and the remaining notes, d to f3, in another. The bottom ten notes would have been strung in brass wire and the notes from d to f3 in iron wire. This differs from that in the Franco-Flemish instrument, in which the change in spacing occurs fifteen notes above C/E at the lower-manual note fT. This difference amounts to a basic distinction between the design concept used by the maker of the Franco-Flemish harpsichord and that employed by Ioannes Ruckers. In order to calculate the lateral spacing of the strings in the Ruckers harpsichord, the measured points were again fitted to a straight-line using a regression analysis in order to calculate the slopes of the lines. This involved fitting the bass notes from C/E to cT and the middle and treble notes from d to f3 separately. The slope of these lines and their interpretation are summarised in Table 3. The error in this result is just the standard deviation error for the average slopes of the 4' and 8' treble string spacing found, since both numbers, 12 (strings) and 6 (duimen), used to arrive at this length value are mathematically precise and have no error. This value of the short duim is notably greater than that calculated in my previous work on the case measurements of Ruckers instruments. The latter calculation was, however, based mostly on the height of the case walls of Ruckers virginals and harpsichords. It seems likely that the Ruckers would have employed the same unit of measurement to measure out both the case heights and the lateral string spacing. Here, it would appear that Ioannes Ruckers gave the 8' bass bridge pins a lateral spacing with five strings occupying a space of 2 duimen (or 20 strings in 8 duimen). The difference between the calculated and the assumed is about 2%, which is close to the standard deviation error found in Table 2 plus the error in the newly calculated value of the short duim. Thus, this assumption seems valid. The difference in the spacing of the bridge pins in the treble and in the bass of the 1638 IR 8' strings is 13.86 – 10.01 = 3.85mm. This is much greater than the value found for the Franco-Flemish harpsichord above. Since here it is only the bottom 10 notes (9 spaces) that have this spacing the bottom pin is moved 9x3.85mm = 34.65mm further from the spine than if the bridge-pin spacing had been maintained at its regular value in the treble. This is also considerably greater than the total distance for the Franco-Flemish harpsichord and amounts to therefore 34.65/25.48 = 1.36 duimen, or about 1 duimen. A similar procedure carried out for the 4' strings shows that the bass 4' string is moved about 10 linien or 10 lines away from the spine (see immediately below). Similarly, the slope of the bass 4' section is . This, also expressed in terms of the newly calculated value of the short duim, corresponds to a lateral spacing with five strings occupying a space of 2¼ duimen (or twenty strings in 9 duimen) for the 4' bass bridge pins. The simplicity of the way in which the bridge pins and strings are spaced out is very striking and clearly reveals the meticulousness nature of Ioannes Ruckers’ working methods. Because he wanted the angling of the 8' and 4' strings to be closely similar for each note and each pair of strings, Ruckers pushed the longer 8' strings farther from the spine by using a tighter spacing with fewer notes per duim for the 8' strings than for the 4' strings. In doing so, the angle of each 8'/4' string pair was closely similar. This refinement does not seem to have been practiced by the original maker of the Franco-Flemish harpsichord, who appears to have used the same spacing for both the 8' and 4' bass bridge pins. The above analysis also points out a fundamental difference in the way Ioannes Ruckers and the original maker of the Franco-Flemish instrument conceived the spacing of the strings. The former, at least for the treble strings, thought in terms of the size occupied by one octave of strings and keys; the latter, in terms of the spacing of a given number of strings in one Antwerp voet. Not surprisingly, the latter calculation differs only 0.2% from the usual 500 mm found universally in the keyboards of instruments built in the Ruckers tradition. Although the analysis leading to this result is rather complicated, it is one of the strongest and clearest indications that the Franco-Flemish harpsichord was not built by a member of the Ruckers/Couchet family. This value of the duim is notably greater than that calculated in my previous work on the case measurements of Ruckers instruments and is also greater than that found from the lateral spacing of the treble strings of the Ioannes Ruckers harpsichord. Expressed in terms of the voet, this is equivalent to 283.5mm±0.15% = 283.5±0.4mm. This value of the voet is noticeably less than the value normally quoted in reference sources, which is given in the range 284.2 mm to 286.8 mm. However, my research into the instruments of the Ruckers family has already shown that two different sizes of the duim were in use in their workshops at the same time. No other North-European centre other than Antwerp used a value of their own unit of measurement (including for example the Saxon Fuss and the Amsterdam duim and voet) that gives the same agreement with results that clearly lie within the calculated experimental error. Therefore, the difference between the 25.336 mm duim used by Ioannes Ruckers and the 25.675 mm duim employed by the maker of the Franco-Flemish harpsichord further establishes that the latter instrument was not made by any member of the Ruckers family, since the workshop unit of measurement was also different. This calculation appears to indicate that the maker of the Franco-Flemish harpsichord intended the case height to be 11 duimen or exactly one Flemish voet. 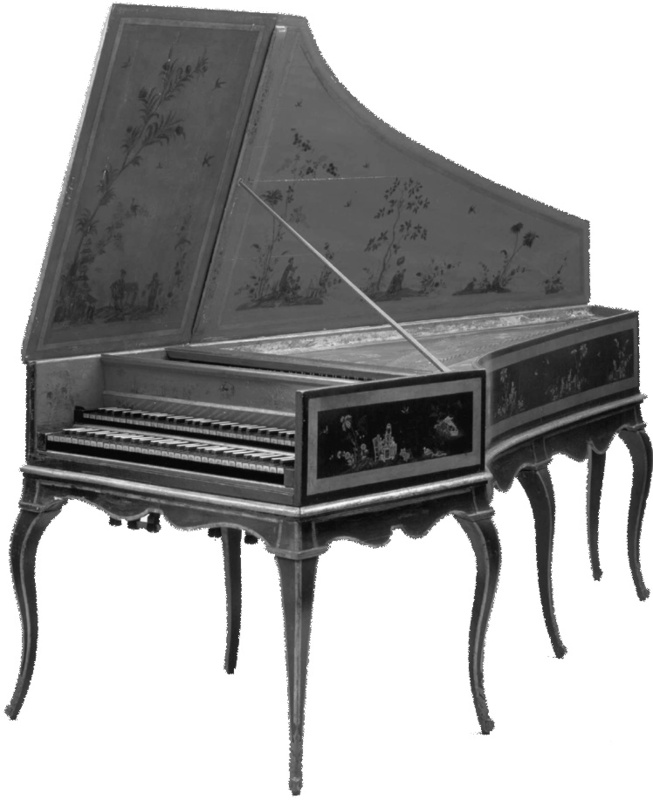 To my knowledge, no Ruckers or Couchet harpsichord has a case height of 11 duimen or 1 voet; all Ruckers/Couchet double-manual harpsichords have a case height of 10½ duimen. This is but one more indication that the Franco-Flemish instrument does not belong to the Ruckers/Couchet tradition. The unconventional analysis carried out in this article establishes that the instrument was made in Antwerp using the Antwerp duim. The precision of the statistical analysis gives an internal consistency of the results and makes it virtually certain that the instrument was built in Antwerp, not in some other centre. No other unit of measurement could provide a set of results with such accuracy as found here from a study of the lateral string spacing. Therefore, the actual mathematical precision of the analysis carried out in this article increases greatly the certainty with which we can ascribe an instrument to a given maker, or at least to the centre in which it was made. Such a high level of precision also reduces the probability, referred to at the beginning of this study, that an incorrect ascription or attribution will be made. However, the analysis, along with many features of the remaining original parts of the instrument, also indicates that the Franco-Flemish harpsichord was not made in the tradition of the Ruckers family. Indeed, an examination of a genuine Ruckers double-manual harpsichord reveals that the design of the lateral string spacing and bridge pinning is completely different from that in the Franco-Flemish instrument. This harpsichord may therefore be added to the ever-growing number of instruments recognized as non-aligned, double-manual harpsichords made in Antwerp but not by a member of the Ruckers/Couchet family. The ravalement of the instrument was accomplished competently, professionally, and accurately. In its present state, the harpsichord preserves many of the musical and mechanical properties of its last ravalement state. However, the baseboard, the wrestplank and nuts, the pedal or genouillère, the ravalement rear row of jacks, and all the ephemera (quills, dampers, keyboard cloths, and so forth) no longer remain. Clearly the restoration of the instrument can be completed only with an accurate and justifiable re-construction of the 18th-century-state string scalings and nut-pin spacings which were altered when the original wrestplank was destroyed in the intervention of 1971. The approach that I have used here is to try to give the instrument new scalings based on other contemporary French harpsichords which would clearly have used the French pouce in their design and construction. Numerous sources give a value for the pouce of 27.06996mm. Hence the use of this unit of measurement was researched in the instruments of various French makers, and in particular those made and altered by Pascal Taskin. Figure 5 shows a plan view of the Franco-Flemish harpsichord before restoration. The plywood baseboard is visible in the keywell space on the right as is the replacement wrestplank with the nuts pushed very closely towards the gap. The scalings of the instrument as found before the present restoration are plotted in Figure 8. This shows that the 4' and 8' scalings are vastly different: the 8' c2 scaling is 354mm whereas the 4' c2 scaling is only 310mm. The top 4' string, on the other hand, has a c2-equivalent scaling of 437.3mm. These do not represent normal French practice. A study was therefore made of a number of 18th-century French harpsichords such as the 1763/84 Goermans/Taskin (Figure 9), which also has four registers. The scalings of this instrument are plotted in graph shown in Figure 10. This graph shows that the 8' f scalings are based on f1 = 20 pouces and the 4' f scalings are based on f = 19 pouces or f1 scalings on 9½ pouces. The study of a number of other French 18th-century instruments which I have made produced results which were essentially the same as these. It was therefore decided to use these f1-equivalent scalings to design the string lengths of the Franco-Flemish harpsichord. The string scaling os the 1763/84 Goermans/Taskin harpsichord were measured and are plotted below. These scalings represent those given to the instrument by Taskin who also marked the string gauges with die stamps on the wrestplank near the tuning pins. These gauge markings repeat occasionally indicating that Taskin wanted the strings at the markings to have the same diameter, but be of different materials. These material transitions are marked on the scaling curve below with heavy doubled lines. The scaling-transitions are given in both millimetres and in French pouces. In order to carry out this process an AutoCad drawing of the instrument was therefore made (Figure 11). A corresponding drawing of the plan view was also made onto which the bridge-pin positions were plotted, in part using the lateral positions seen earlier on in Table 1 (see Figure 7). Figure 11 – Plan view drawing by John Bell. The non-original soundbars, although shown here, were not retained in the eventual restoration. Not shown here are the bridges and the 4' hitchpin rail. Basing string scalings on an f1 8' scaling of 20 pouces and an f1 4' scaling of 9½ pouces, the nuts were drawn in in positions which best gave these scalings with an 8' FF string of 65½ pouces and a 4' FF string of 42½ pouces, these being the longest strings for this note that could comfortably be fitted onto the wrestplank (Figure 12). It was, of course impossible to give all of the strings their desired theoretical lengths without using an unrealistically distorted nut curve. The new nut positions were chosen to give scalings that were as close as possible to the theoretical values and a curve to the nut that was practical from the point of view of bending the wood from which it is made. In fact the shape of the nut that resulted was almost a straight line, although both nuts curve in a slight arc in a direction away from the player. The 1971 nut positions and the proposed restoration nut positions are shown in Figure 12. The lengths of the strings measured from the drawing with the proposed nut positions are given in Table 3. Figure 12 – Plan view drawing of the soundboard and wrestplank areas used to determine the restoration nut positions. The drawing shows each of the c and f notes. The latter were based on 8’ scalings which gave an f1 = 20 pouces and 4' scalings which gave an f1 = 9½ pouces. The found scalings, the theoretical scalings based on an 8' f1 = 20 pouces and a 4' f1 = 9½ pouces, and the lengths measured from the drawing are given below in Table 3. Table 3 – The string lengths as found, theoretically based on an 8' f1 = 20 pouces and a 4' f = 19½ pouces, and as realised in practice. Here the pre-restoration found lengths are given in Column 3, the theoretical lengths based on the proposed scalings for f1 are given in columns 4 and 5, and the actual string lengths measured from the drawing in both pouce and in millimetres in the two right-hand columns. These figures show that the proposed positions of the nuts give string scalings that are accurately Pythagorean for two octaves above f1 as is normally the case for most 18th-century French harpsichords and, indeed, for most North-European harpsichords of this period. The resulting scalings are plotted in Figure 13. The ravalement positions of the bridges simply prevent the string scalings from being Pythagorean for the top half an octave of notes (see Figure 13). In fact, although the scalings are not Pythagorean in the extreme treble, the bridges having been pushed away from the gap and the upper belly rail produce a better sound than they would have if cramped near the upper belly rail with Pythagorean scalings. The fine trebled strings, which are work hardened and therefore stronger than the thicker strings lower down in the compass, are easily able to withstand the extra tension produced by the longer scalings in this part of the compass of the instrument. Figure 13 – The string lengths measured from the drawing shown in Figure 12 above. Here the same red-brass and yellow-brass scalings (8½ pouces and 11 pouces respectively) were used as found for the 1764/83 Goermans-Taskin in the Russell Collection, Edinburgh in order to determine the transition notes from red-brass stringing to yellow brass stringing and from yellow-brass stringing to iron stringing, respectively. The drawing used in Figure 12 to position the new nuts is simplistic in that the strings are shown all parallel to one another and to the spine. In fact, of course, this is not the case as has already been seen. In order to find the correct position of the nut pins, a drawing of one of the registers was added to the drawing of Figure 12 in a position that is more-or-less central in the gap (see Figure 14) Virtual quills were drawn out from these which projected a distance of about 1½ lignes or 4mm. The nut-pin positions were then found by projecting the strings from the bridge pin past the end of the quill to the line of the nut pins (Figure 14) for the long 8' and the 4' strings. Figure 14 – A detail of the bass side of the wrestplank showing the virtual quills in the gap for the 8' jacks (rear) and the 4' jacks (front) with the f strings (dark grey) and the c strings (light grey) projected from the bridge pins for these notes past the quills to the line of the nut pins found in Figure 12. This was done for all of the strings (Figure 15), and the nut positions were marked on a kind of string-band strip seen at the bottom of the drawing. Figure 15 – The drawing of all of the strings projected from the bridge, past the virtual quills to the line of the nut pins. The lateral position of each of the resulting nut pin positions was transferred the ‘string-band strip’ shown at the bottom of the diagram for both the 4' and 8' nut pins. The lateral position of each of the marks on the string-band strip at the bottom of Figure 15 was then plotted in a graph like that of the lateral bridge-pin spacings already seen in Figure 6 and Figure 7 above. The lateral nut-pin spacings are shown in Figure 16 below. Figure 16 – Graph of the lateral nut pin spacings measured from the string-band strip seen at the bottom of Figure 15 above. This graph shows that the line plotted for the nut pins does not break into two sections as with the bridge-pin spacing graphs (Figure 6 and Figure 7). Both the 8' and the 4' nut pin positions form a single straight line. The slopes of these lines have been calculated, again using the usual regression analysis. This shows in a particularly elegant way that the slopes of the two lines are the same to within 3 parts in 14,000 (0.02% difference!) and so are clearly identical. The slope of the nut-pin spacing line is also very close to the treble spacings of the 8' and 4' bridge pin spacings found for this instrument and seen in Figure 6 and Table 2 above. The average bridge-pin spacing, originally measured out using the Antwerp duim is 14.185mm, and the average nut-pin spacing found using the method outlined here is 14.119mm. Thus, with the lateral nut-pin spacing being slightly less than that for the bridge pins, the strings would converge very slightly in going from the bridge to the nut. This shows that the slope of the lines for the 8' and 4' nut pins in Figure 16 is equivalent to a spacing of 23 strings in 12 pouces = 1 pied within an accuracy of less than 2 parts in 5000 (0.04%!!!). This seems to indicate clearly that the person who carried out the ravalement simply marked out a stick for positioning the nut pins relative to the spine such that 23 strings occupied a space of exactly 1 pied or one French foot! The lateral spacing of the jackslots in the registers was also measured relative to the bass end of the register in a way similar to that carried out here. The spacings were plotted and subjected to a regression analysis, and these were also found to have been spaced in such a way that 23 jackslots in the register occupy a space of 1 pied. This should not be surprising since the lateral bridge-pin spacings are very similar to the lateral nut-pin spacings making the strings almost parallel to one another and passing the jacks in the jackslots with the same lateral spacing as the nut pins. Here the difference between the calculated value of the pouce from the measured total width of the keyboard and the value of 23 naturals put into a space of 20 pouces amounts to only 0.05%, and is well within the accuracy of the measurement of the total keyboard width. It therefore appears that the person who carried out the ravalement thought in terms of giving the keytails (and jackslots and nut pins) a spacing with 23 notes in 12 pouces = 1 pied, whereas he placed 23 naturals at the fronts of the keylevers into a space of 20 pouces thinking in both cases in terms of 23 keytails or keyfronts! The use of the unit of measurement in the analysis of the bridge pin spacing of this instrument provides a method of determining the place of origin with a high degree of accuracy and therefore a high level of confidence. The analysis of the way the unit of measurement was used by the maker of the Franco-Flemish harpsichord and by the Ruckers shows how they thought and how they proceeded with their design in a way that helps us to begin to enter into the thought processes of these makers. We begin, finally, to start to get into their heads and to understand what aspects of the design of an instrument were important to them, and how they actually carried out their designs. The use of the unit of measurement is also essential when trying to re-construct some lost or destroyed component of an instrument in a restoration. Clearly such features as the string scalings and the lateral nut-pin spacings are not arbitrary but are the result of specific design procedures carried out by the historical maker. I feel highly confident that the restoration string scalings and the lateral nut-pin spacing used in the restoration of this harpsichord are very close to those of the person who carried out the ravalement procedure. I feel that the analysis carried out here also shows the sophistication both of the original design, and also of the builder who carried out the ravalement. The tiny errors in the results shown here also show the incredible accuracy with which they worked. In my opinion a careful analysis of the unit of measurement as used in the construction of an instrument opens out a whole new aspect of historical stringed-keyboard instrument design and is also an essential tool when used during a restoration of the type encountered here. for many important further details. Barberini is probably the person who carried out the ravalement. He may therefore be the Jacques (Giuseppe?) Barberini who worked on the Rue de la Verrerie in Paris, the same street on which both Pascal Taskin and Jean Goermans had their workshops (see Colombe Samoyault-Verlet, Les Facteurs de clavecins parisiens: Notices biographiques et documents [1550–1793] (Paris: Société Française de Musicologie, Heugel, 1966) 14). Barberini entered the guild of the joiner/instrument builders in 1783 and was responsible for the selling of English pianos in Paris. Constant Pierre refers to him when mentioning makers who joined the Paris harpsichord makers’ guild after 1775: “De 1783 a 1788: Jacques Barberini, rue de la Verrerie (1783–91), ou il tenait des forte-pianos anglais des meilleurs auteurs” (Les Facteurs d'instruments de musique, les luthiers et la facture instrumentale, précis historique (Paris: Sagot, 1893) 134–35). After a thorough examination of the instrument and an extensive search for the Barberini signature or calling card, no trace could now be found of it. This suggests that the signature was probably originally found on the baseboard or wrestplank both of which were unfortunately removed by Roberto De Regina in 1971. In his catalogue of all known signed harpsichords and clavichords, Donald H. Boalch lists: “HOFFMANN, N. Fl. 1781–90. Parisian harpsichord maker living in 1781 in the rue Perce-St-Séverin, and subsequently in 1788–90 in the rue Quincampoix” (see Makers of the Harpsichord and Clavichord, 1440–1840, 3d ed. by Charles Mould (Oxford: Clarendon Press, 1995), 92). Samoyault-Verlet (Les Facteurs, 49) gives only the following cryptic comment regarding Hoffmann: “HOFFMAN (? ), facteur de clavecins (fin du XVIIIe s.) Rue Quincampoix. Signalé par l’Almanach des Marchands de 1788 à 1790.” Both addresses given for Hoffmann are on the south side of the Seine. No further references to Hoffmann are known, and none of his instruments survives. Iohannes, Johannes, Hans, Hannes, and so forth are variations of the Latin form Ioannes or, in English, John. Hans and Jan would have been the familiar forms of this name in Flemish. See Grant O’Brien, Ruckers. A Harpsichord and Virginal Building Tradition, (Cambridge: Cambridge.University.Press, 1990; digital reprint, Cambridge: Cambridge University press, 2008), pages???? For a discussion of the preparation and use of a string-band strip, see O’Brien, Ruckers, 173–75. See O’Brien, Ruckers, Chapter 9, pages?????. A more detailed analysis of the instrument and the seventeenth-century state is given in a paper by me: 'Analysis of the origins of a large Franco-Flemish double-manual harpsichord. Would a Ruckers by any other name sound as sweet? ', Early keyboard journal, 22, 2004, p. 49-80. For information about the Van Blankenburg problem, see O’Brien, Ruckers, 209 ff. The short 8' pin is the original pin placed in the bridge of the instrument by the original maker; the long 8' pin is the one added duing the French ravalement. The Ruckers and some other Flemish makers designed and marked out their instruments around the notes c and fT. Pin holes for positioning the bridges during gluing are often visible at these notes on the soundboards and bridges of their instruments. Using the eI/gT doubled pinning to identify the notes sounded by the strings on the pins, it is clear that the positioning holes in the Franco-Flemish harpsichord were located either at the notes c and g relative to the notes played on the lower manual (f keyboard) or at the notes g and d relative to the notes played on the upper manual (c keyboard). This design is a clear deviation from the (so far as I know, universal) Ruckers/Couchet tradition where the positioning holes were located at the notes c and fT. This is yet another indication that the Franco-Flemish harpsichord does not belong to the Ruckers/Couchet tradition. This is a simple procedure which most spreadsheet programmes can carry out on a set of data which approximate a straight line when plotted as here. Although the points plotted here lie very close to a straight line, they all deviate slightly and are positioned slightly off the straight line. This procedure optimises the fit of the straight line to the data by finding a straight line that minimizes the square (in order that all distances squared are positive numbers) of the distance of the various points from the straight line. For this reason it is called ‘the method of least squares’. Although carried out here using a computer analysis it can be easily (but somewhat laboriously) be carried out manually without the use of a computer or calculator. If the first bridge pin is numbered 0, then b is just the distance of the first bridge pin from the spine. The use of a regression analysis to determine the slope m in a straight-line equation is discussed with examples in my paper, ‘The use of simple geometry and the local unit of measurement in the design of Italian stringed keyboard instruments: an aid to attribution and to organological analysis’, The Galpin Society Journal, 52 (1999) 108-171. ISSN 0072.0127. This calculation assumes the same workshop unit of measurement as that used by the Ruckers. This instrument is the famous Ioannes Ruckers double-manual harpsichord in the Russell Collection of Early Keyboard Instruments at the University of Edinburgh (Cat. no. HD2–IR1638.6), which still retains its original, unaligned keyboards and all of its original bridge and nut pinning. See http://www.music.ed.ac.uk/russell/instruments/hd2ir16386/table.html. See the discussion of stringing in O’Brien, Ruckers, 58–62 and 293–95. See also Klaas Douwes, Grondig ondersoek van de toonen der musijk (Franeker: 1699; facs. ed., Amsterdam: Fritz Knuf, 1970), part 2. Douwes lists indicate that the string material, regardless of the type of instrument being considered, should change from yellow brass to iron between the notes cT and d in the tenor register. This error is of the order of 1 mm and therefore close to what one would expect from the gross measurement of the three-octave span of an instrument measured from the keys. Fortunato Bartolomeo de Felice Encylopédie ou dictionnaire universel raisonné des connaisances humaines (Yverdon: 1770–1780) s.v. ‘Anvers’ gives 284.2 mm; and Angelo Martini (Manuale di metrologia (Turin: E. Loescher, 1883; reprint Rome: Editrice E. R. A., 1976), p. 38 gives 286.8 mm. Among these are Colonel Cotty, Aide-mémoire a l’usage des officiers d’artillerie de France, 2 (Paris, 1819) 896-7, Horace Doursther, Dictionnaire universel des poids et mesures anciens et modernes, (M Hayer, Brussels, 1840), and Angelo Martini, Manuale di metrologia, (E. Loescher, Turin (also Rome and Florence), 1883; reprint Editrice E.R.A., Rome, 1976). Although modern organologists usually use and quote the c notes, when describing instrument scalings, this is not the case with the historical makers. However, research which I have carried out in the past indicates that many Italian, French, German and English makers of the historical period based their designs, not on the c notes but on the f notes. Such is also the case here. The gauges of the strings of each material were calculated by making the string tensions for each note on the Franco-Flemish harpsichord match as closely as possible those of the Goermans-Taskin harpsichord where the string gauges are marked,.